P. F. O’Neill was a soda water manufacturer located in New York City’s Lower Manhattan for almost 40 years. According to the 1900 census records, he was born in Ireland in 1859 and immigrated to the United States in 1876. Paul F O’Neill (waters) was first listed in the 1886/1887 NYC General Directory at 185 Franklin St., however, the September 1, 1883 “City Record” included him on a list of First Assembly District members as “Paul F. O’Neill, mineral waters,” with the 185 Franklin St address. Based on this it appears that the business extended at least as far back as 1883. O’Neill began using the United Bottling Co. as a registered trade name as early as 1890. The 1890 Copartnership and Corporation Directory listed the business as: United Bottling Co. (Paul F. O’Neill, propr.) 185 Franklin St. In the 1891 NYC General Directory, O’Neill’s address changed to 508 Greenwich St. A relatively small operation, the Annual Report on Factory Inspections in New York State for 1898 listed the business with 5 male employees. Sometime after 1927 O’Neill changed his address to 74 Varick St where he was listed as a soda water manufacturer in the 1931 and 1932 commercial directories. In 1933 he was still listed at 74 Varick Street but under the occupation of real estate. 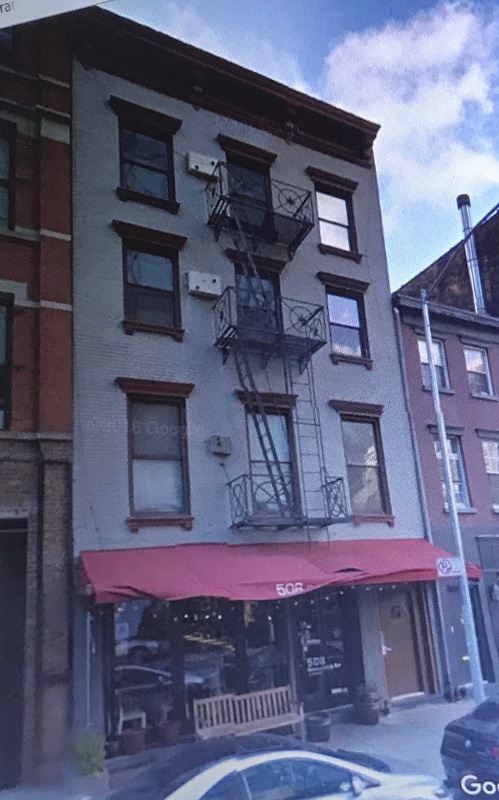 Today 508 Greenwich is a four-story walk-up with a bar/restaurant at street level and an ornate exterior fire escape. “Street Easy says it was built in 1900 but O’Neill was using it as his address continuously since 1891. I assume that the 1900 date was probably the construction date of an addition. It must have housed the business. The bottle I found is a tooled blob (8 oz) embossed with the 508 Greenwich Street address. Although O’Neil moved to 508 Greenwich in 1891, I’ve seen 2 different variants of this bottle on the Internet and this appears to be the newer version, so I’d say it’s early 1900’s. Although the business extended into the early-1930’s, I’ve not yet seen an example of a tooled crown finish or machine made bottle associated with this business. Previous Previous post: Trommer’s Evergreen Brewery, Brooklyn, N.Y.
Next Next post: J. H. VanBrunt, Far Rockaway, L. I.